Western blot analysis of extracts from various cell lines using SMC2 (D11F9) Rabbit mAb. SMC2 (D11F9) Rabbit mAb recognizes endogenous levels of total SMC2 protein. 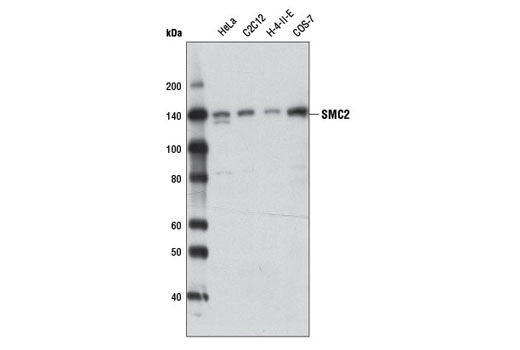 This antibody does not cross-react with other SMC proteins, including SMC1, SMC3, and SMC4. Monoclonal antibody is produced by immunizing animals with a synthetic peptide corresponding to residues near the amino terminus of human SMC2 protein. Structural maintenance of chromosomes 2 (SMC2) and 4 (SMC4) proteins are subunits of the condensin complex, which enables chromosome condensation and maintains the compaction of chromosomes as they separate to opposite poles during anaphase (1-3). In addition to regulating chromosome condensation, condensin is a general regulator of chromosome architecture and may function to regulate gene expression and DNA repair. SMC proteins contain a hallmark bipartite ATPase domain of the ABC ATPase superfamily, which consists of an N-terminal Walker A motif nucleotide-binding domain and C-terminal Walker B motif catalytic domain that interact to form a functional ATPase (1-3). The two ATPase domains are connected by two coiled coil domains separated by a central hinge region that facilitates protein-protein interactions between partnering SMC proteins. In the case of the condensin complex, SMC2 and SMC4 interact to form a functional ATPase required for chromatin condensation; however, the mechanism by which this ATPase activity regulates chromsome architecture is still being determined. In addition to SMC proteins, condensin contains three auxiliary subunits, which function to regulate condensin ATPase activity. Higher eukaryotes contain two distinct condensin complexes (condensin I and II), both of which contain SMC2 and SMC4 (1-3). Condensin I also contains the auxiliary subunits CAP-D2, CAP-G and CAP-H, while condensin II contains the related auxiliary proteins CAP-D3, CAP-G2 and CAP-H2. The two condensin complexes show different localization patterns during the cell cycle and on chromosomes and both are required for successful mitosis, suggesting distinct functions for each complex (1-3). Losada, A. and Hirano, T. (2005) Genes Dev 19, 1269-87. Hudson, D.F. et al. (2009) Chromosome Res 17, 131-44. Legagneux, V. et al. (2004) Biol Cell 96, 201-13.